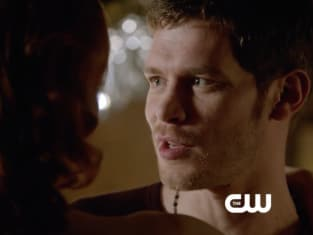 One thing's for sure, The Originals Season 1 Episode 18 definitely came back with a bang! Or a heart on the floor. You know, whichever. When Genevieve asks Elijah to host a fete de benedictions festival and party for the witches the elder brother agrees, knowing doing so would help strengthen his position in town. The party quickly turns deadly as some of Marcel's loyalists stage a bit of a rebellion, ushering Davina an the rest of the Harvest girl witches out of the room. In the bayou, werewolves are pouring out of the woodwork to catch a glimpse of their newly returned queen and Hayley isn't quite used to the attention. [to Elijah] No child of mine will be born in a swamp. Permalink: No child of mine will be born in a swamp. The Originals Round Table: "The Big Uneasy"
The Originals Music: "The Big Uneasy"